Last year, 2012, Kelsall WI offered no competition entries at all, so this year, we decided to do a little better! This year’s theme was Town and Country, and, for the first time in a few years, we decided to enter into the combined co-operative class. Sue Malcolm very kindly agreed to organize our entry, in the competition named “The Corner Shop”, and work started on the project long before the date of the show, the 18th and 19th of June. In addition to the combined entry, two other members entered the individual classes…Margaret Davies entered the painting competition, and Dot Berry entered the competition for preserves. After a lot of work, our entry for the combined class was ready. It comprised the staging, built by Pat Symms’ brother- in- law (surely an honorary member of the WI during the period of his efforts), plus three individual items. The staging gave the impression of looking out of a shop window, onto a street with quite a few businesses for sale. The photograph of the street had been taken by Sue on the Isle of Arran, and very cleverly reflected this year’s resolution. The all important three items to interpret the class were a Dundee cake, baked by Marian Franks, a lace book mark, made by Heather Leather, and a jar of lemon curd, made by Sandra Bell. Margaret’s painting in the art competition (for watercolour/gouache/ water soluble crayon, or oils or acrylics) needed to reflect the class title “Landmarks”. 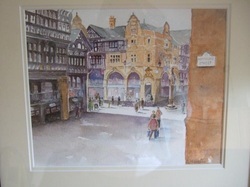 As with the combined entry, Margaret spent a great deal of time perfecting her painting, in watercolour, which showed the Chester Cross, as seen from the Rows near the bottom of Northgate Street. Unfortunately, Dot’s entry for the produce class, any true preserve, was destined not to be! She had intended to make a jar of elderflower and gooseberry jelly, but there were neither elderflowers nor gooseberries to be had for the task. Due to the weather, it was too early. Judging of the competitions took place as always on the Monday, and those helping on the Tuesday arrived with eager anticipation. Imagine our delight to find that not only had Margaret won first prize in her class, with effectively double top marks, but was the outright winner of the whole of the art section, receiving a rosette and a winner’s scroll. Well done Margaret! In addition to all this, a photo of Margaret’s painting appeared in the Chester Chronicle. Not for the first time has Margaret’s skill hit the press! 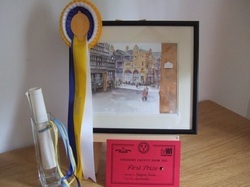 All the effort which had gone into the combined class was also greatly rewarded, and the team was delighted to be awarded second prize, also with two top mark cards, given for the staging. Sue was delighted when she heard and passed on the news to the other three participants. Well done! In addition to our competition entries, as usual, several of our members had volunteered to help in the refreshment tent. From experience, one of the worst job here is probably washing lettuce for three hours, which Heather had to do once, but we were in for more exciting times! Cake icing was the order of the day on the Wednesday, which was quite enjoyable, I gather, and on both days, one of our members was present in the hospitality trailer, to assist Ro Cowell. As a member of the Homes and Gardens committee, Ro had undertaken to be in charge of this very important area, for the first time, and she fulfilled this role admirably. Let’s hope that Ro will do the same next year, again with the help of some of her Kelsall friends. There were no stewards from Kelsall this year, but our representation at the Cheshire Show would not be the same without our own Mary Diggle, who, I am sure, has not missed a year for quite some time, and who this year was helping out on the publications desk. We must not forget that the cakes being served in the refreshment tent would not exist without the efforts of all the members from around the county who bake for the occasion. Six of our members had volunteered to bake cakes, and I am sure that they were greatly appreciated! All in all, Kelsall WI did extremely well. Our two competition entries were excellent, and all the volunteers had a very enjoyable time. As always, the level of competition entries was unbelievably high, the refreshment tent was heaving, and, to cap it all, the weather was great!